Voltamp's range of low voltage transformers comprise of Auto Transformers, Double Wound / Isolation Transformers, Ultra High Isolation Transformers and Custom Designed Transformers. 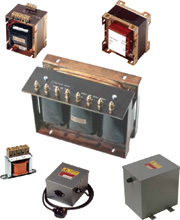 Voltamp Transformers are available in open, enclosed, oil cooled models to suit the customers requirements. Insulation class can also be selected by customers as per their requirements. Voltamp transformers are manufactured conforming to I.S. 2026 and I.S. 11171. Voltamp uses high permeability CRGO Cores and electrolytic copper conductors and non hygroscopic insulating materials to ensure the transformer conforms to the designed parameters. Control Panels and Test Benches. Given below are the upper limits of current and voltage ratings of the Transformers being offered at present. Air cooled transformers are available in open and enclosed models. The enclosed models are supplied in sheet steel enclosures. Louvering is provided for the dissipation of the generated heat. Small transformers up to 10 KVA 1Ph can be provided with wall mounting facility. Oil cooled transformers are housed in M.S. tanks and provided with adequate pressed steel radiators to ensure proper heat dissipation. Oil cooled units are available with standard accessories viz. : oil level indicator, drainplug/drain valve, earth terminals, unidirectional C.I. wheels, oil fill hole & terminal covers.